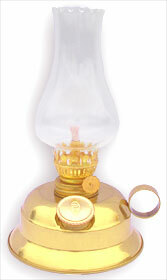 These oil lamps are real beauties. Their wick gives optimum alternative lighting. The Dietz 7" Desk Lamp is perfectly suitable for dining rooms, living rooms, kitchens, mantles and bedrooms because it has the power to light a standard size room, enabling you to go about your normal routine of working, reading, or just holding a conversation with friends and family. Uses almost any lamp fuel including kerosene, citronella, paraffin etc. These are very charming, suitable for any decor. Buy two of our Lamps and get a third lamp free.